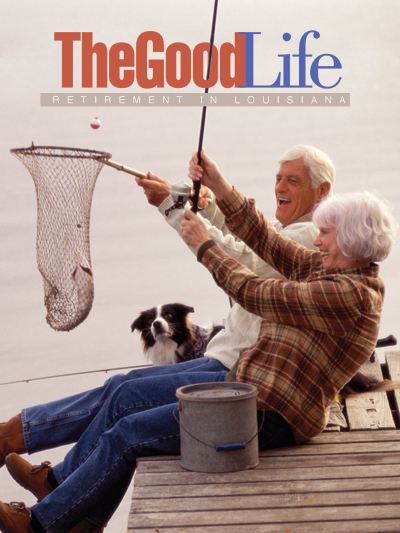 Enjoying the outdoors is a big part of living the good life in Louisiana. In each region of the state, beautiful vistas await those who long to leave behind the city’s noisy crowds and reconnect with nature. As more of us spend our workdays “plugged in” via laptops, tablets and smartphones, we relish the chance to unplug. For some, that means an activity like hiking, fishing or swimming. For others, relaxation comes in the form of bird-watching or touring botanical gardens. Take a look at what awaits you in each area of our state and start planning your Louisiana outdoors adventure. And don’t worry – we’ve included lots of suggestions for exploring the state’s cities and towns, too. Indoors or out, there’s always lots to do. Sheila Norman of the Shreveport-Bossier Convention and Visitors Bureau says people flock to the major bass fishing events held on the Red River. Also appealing are the paved trails on each side of the river, just right for taking a walk or bike ride. There’s plenty of water fun at Cypress Bayou and Caddo Lake, too, Norman says, including waterskiing, wakeboarding and fishing. You needn’t drive far to find a state park in North Louisiana. In the middle of the state, near Ruston, is Lake D’Arbonne State Park. Its cool pine forests are ideal for setting up camp or renting a cabin, and bicyclers will get a workout on the park’s rolling hills. You’ll find fishing piers and boat docks, too, just right for those seeking bass, catfish, crappie and bream. The park also has tennis courts, a disc golf course and a swimming pool open during the summer. Want more? Try Chemin-a-Haut State Park, north of Bastrop; Lake Claiborne State Park, southeast of Homer; Lake Bistineau State Park, southeast of Shreveport; or Jimmie Davis State Park at Caney Lake, southwest of Chatham. Each park has its own mixture of offerings, including pools, cabins, campsites, boat launches and nature trails. Louisiana also has one national forest, the Kisatchie National Forest, which spreads across seven parishes in the north and central parts of the state. The huge park has more than 100 miles of trails and 40 developed recreation sites. You can swim, fish, hike, ride mountain bikes and OTVs, go horseback riding and camp. You’ll need more than a day or two to explore all the forest has to offer. And bring your camera, because you’ll find dedicated spots for viewing flora and wildlife. Photography is especially popular at Black Bayou Lake National Wildlife Refuge in Monroe. Because of the wide variety of birds and wildlife at the refuge, people bring their cameras to take advantage of the photo blind, observation pier and deck, nature trail and boardwalk through the wetlands. You’ll also find an arboretum and places to hunt and fish. If you visit North Louisiana in the summer, your swimsuit will get a workout at Splash Kingdom Family Water Park in Shreveport. If golf is your thing, you’ll love Olde Oaks, part of the Audubon Golf Trail. The 27-hole course is set in rolling hills near Shreveport, and golfers can see many species of native wildlife. If your idea of a nature walk is finding yourself knee-deep in fragrant flowers, spend an afternoon at the Gardens of the American Rose Center in Shreveport. The Gardens are the national headquarters of the American Rose Society and at 118 acres make up the nation’s largest park dedicated to the rose. You can tour more than 65 individual rose gardens with some 20,000 rose bushes. North Louisiana also has a rich mix of history and culture to attract visitors. The twin cities of Shreveport and Bossier, on either side of the Red River, are a good place to start. Take in a movie, have a meal or scoop up a bargain at The Outlets at Louisiana Boardwalk in Bossier City, home to more than 60 retailers. You can try your luck at several riverboat casinos or wager on the horses at Harrah’s Louisiana Downs. Youngsters of all ages will be mesmerized at Sci-Port – Louisiana’s Science Center. The center’s 92,000 square feet are filled with hundreds of hands-on exhibits, an IMAX Dome Theatre, a space center and a planetarium. Kids and adults will both enjoy visiting Gators & Friends Alligator Park and Zoo, about a 20-minute drive from Shreveport. You can watch giant alligators eat, swim and wrestle with each other, and hold a baby alligator in your hands (don’t forget the cameras!). In 1894, candy store owner Joseph Biedenharn had the bright idea to have his brother put Coca-Cola into bottles, thus becoming the first Coca-Cola bottler. Today, you can visit the Biedenharn Museum and Gardens in Monroe, with a Coca-Cola museum, a Bible museum and beautiful gardens created by Biedenharn’s daughter. North Louisiana also has some interesting historical sites. You can see the mysterious remains left behind by long-ago residents at the Poverty Point World Heritage Site near Delhi. The earthen mounds were built between 1700 and 1100 B.C. ; today, this unique archeological site is open to the public, and tram tours are available. The town of Mansfield, in the northwest corner of the state, was the scene of some fierce fighting during the Civil War. At the Mansfield State Historic Site, you can learn about these battles through living history events, reenactments and exhibits. The Central Region of Louisiana, nicknamed the Crossroads, touches on the Cajun- and Creole-influenced southern portion of the state at its bottom and the hills and forests of North Louisiana at its top. The Red River runs through it, and the region is blessed with an abundance of places to enjoy the great outdoors. Part of the huge Kisatchie National Forest lies in Central Louisiana, offering visitors lots of places to hike, bike, camp and ride horses. In the Calcasieu Ranger District of the forest, southwest of Alexandria, is the Wild Azalea Trail, which travels through five ecosystems in 31 miles. The trail gives hikers and mountain bikers a workout; while so much of Louisiana is flat, the Azalea Trail boasts some good climbs. About 20 miles northeast of Alexandria is the Dewey Wills Wildlife Management Area. The area boasts a wide range of wildlife for hunters, including deer, squirrel, rabbit, raccoons and turkey as well as waterfowl; each season, some lucky hunters bring home trophy-size bucks. The sport fishing is great here, too; look for black bass, white bass, crappie, catfish and bluegill. Spring Bayou Wildlife Management Area, a few miles east of the town of Marksville, offers premier fishing and hunting, including bow hunting for deer. Also near Marksville is Lake Ophelia National Wildlife Preserve. Established to provide safe wintering and breeding for waterfowl, Lake Ophelia is a good place to spot a bald eagle or two. Looking to cool off? Try the Olympic-sized swimming pool at the North Toledo Bend State Park, nine miles southwest of the town of Zwolle. Visitors can enjoy nature trails, picnic sites, camp sites, cabins and spots to fish and boat. Hike through cool pine forests, or enter one of the park’s many fishing competitions. Hodges Gardens State Park, in Florien, is one of Louisiana’s more unusual parks. Oil and gas businessman A.J. Hodges built a floral oasis on an abandoned quarry, using the natural rock formations to create terraced gardens. The site includes nature trails, walkways, footbridges, waterfalls, pools and fountains. Hodges and his wife opened the property to the public in 1957, and in 2007 it was donated to the state. Now visitors can enjoy boating and fishing at the park, and spend the night in its cabins or at its equestrian campground. If you are a golfer, and you like your golf course surrounded by beautiful scenery, try Cypress Bend Golf & Conference Resort in the town of Many on the Texas-Louisiana border. A member of the Audubon Golf Trail, Cypress Bend has 18 holes, 10 of which are along the water. There’s so much more to Central Louisiana than outdoor life, though. A charming place to begin exploring is Natchitoches, established in 1714 as the first permanent European settlements in the territory that later became the Louisiana Purchase. The town has a charming 33-block Historic District. Just south of Natchitoches, along LA 1, is Cane River Country, dotted with old plantation homes. The town is famous for its Chris tmas lights festival. The region also has a variety of state historic sites. On the banks of the Cane River is Fort St. Jean Baptiste State Historic Site, with a full-scale replica of a French Colonial fort built in 1730s. The Forts Randolph/Buhlow State Historic Site in Pineville contains a visitors’ center with Civil War artifacts and a boardwalk around both forts. And the Fort Jesup State Historic Site, near Many, is on the site of a fort built in 1822 by Zachary Taylor. The original field kitchen still remains. • Kent House Plantation in Alexandria, a French Creole plantation home built in 1800 which is the oldest standing structure in Central Louisiana. You get a rare chance to see both the old and the new at Frogmore Cotton Plantation and Gins in the town of Frogmore. You can first tour a working cotton plantation of the early 1800s, including slave quarters and a rare steam gin. Visitors can experience for themselves how hard the work was by actually picking cotton (all months but May and June). The tours include visiting Frogmore’s modern cotton farm, with its computerized 900-bales-a-day cotton gin. Cajun Country, the region of Louisiana noted for its Acadian food, music and culture, also holds a myriad of outdoor wonders. Whether you like your nature activities wild and rugged, or more on the peaceful side, you’ll find something to suit you in this historic part of the state. One of Cajun Country’s best spots to e njoy the great outdoors is the Atchafalaya National Wildlife Refuge, just a mile from the town of Krotz Springs. Part of the country’s largest bottomland hardwood swamp, the refuge is a wonderful spot to hunt, fish, hike and view all kinds of wildlife. It’s also an ideal place to bird watch. The region has several state parks to explore. Lake Fausse Pointe State Park, in St. Martinville, offers fishing, boating and canoeing, a campground and cabins. Three hiking trails let visitors get “up close” with the wildlife, and there’s a water playground where kids and their parents can cool off. Nearby is Cypremort Point State Park, with its man-made beach, picnic pavilions, boat ramp and fishing pier. Near Ville Plate is the 6,000-acre Chicot State Park, with an extensive network of backcountry hiking trails as well as camping spots and places to fish or canoe. Close by Lake Charles, near the Texas border, is Sam Houston State Park. Here you will find tree-filled lagoons, two boat launches, hiking trails and the opportunity to see more than 200 species of birds. • Cameron Prairie National Wildlife Refuge, about 25 miles outside of Lake Charles. The Refuge is called a “birder’s paradise” because of its plethora of birds all year round. During the warm months, you might see a ’gator or two as well. It’s no accident that Cajun Country is known worldwide for its music, food and fun. The word “Cajun” comes from the 1755 expulsion of The Acadians from Nova Scotia. They eventually settled in Louisiana, where they sought to preserve their language and customs. Visit the Longfellow -Evangeline Historic State Site in St. Martinville to learn about the Cajuns along with the Creoles, Indians, Africans and others who contributed to our state’s rich culture. The site contains a reproduction Acadian farmstead. Lafayette is often referred to as the capital of Cajun Country. It offers two opportunities to learn about the region’s past. Acadian Village is a group of authentic homes that were resorted and furnished so visitors could see what life was really like for the early Acadians. In Vermilionville, a living history museum, you can sample Cajun and Creole food, listen to some two-steppin’ music and watch artisans perform their crafts. Another good opportunity to sample the delicious Cajun cuisine is to attend one of the area’s many festivals – the Rice Festival in Crowley, the Frog Festival in Rayne, the Crawfish Festival in Breaux Bridge and the Boudin Festival in Scott are just a few examples. And you haven’t experienced Mardi Gras until you’ve taken part in the more traditional Carnival customs in Mamou. The Baton Rouge region of Louisiana has the proverbial “something for everyone.” The city itself is the state’s capital, home to museums, universities and businesses. But all around lie charming small towns, as well as many lovely parks, wildlife refuges, lakes and other spots just right for outdoor recreation. You can begin enjoying nature in the city itself. Stroll the boardwalks and gravel paths in Baton Rouge’s 102-acre Bluebonnet Swamp Nature Center. Hundreds of bird species share the site with armadillos, opossums, foxes and other wildlife. A large building is filled with live animal exhibits along with photographs and mineral displays. Also in Baton Rouge is the LSU Hilltop Arboretum on Highland Road, where you can relax under tall tree canopies, savor the colorful wildflowers or take a garden tour. It’s a peaceful escape from the busy city. If you are traveling with youngsters, they’ll love playing outdoors at Blue Bayou, Baton Rouge’s popular water park, and nearby amusement park Dixie Landin’. Afton Villa Gardens in St. Francisville is a don’t-miss destination for those who love all things floral. Although Afton Villa, a magnificent antebellum home, burned to the ground in the ’60s, visitors can still enjoy the garden’s thousands of daffodils, camellias, tulips and other flowers during its spring and fall opening seasons. Northwest of St. Francisville, you’ll find plenty of ways to enjoy nature at the Tunica Hills Wildlife Management Area. In addition to horseback riding, hiking and pitching a tent on the campgrounds, you can hunt for deer, turkey and small game or trap coyote, fox and bobcat. Tunica Hills has steep hills and ravines, topography not commonly found in Louisiana. Thirty miles north of Baton Rouge you’ll find the Cat Island National Wildlife Refuge, with four miles of hiking trails ideal for spotting (and photographing) such wildlife as bobcat, mink and wild turkey along with dozens of bird species. Take in the bald cypress trees, some of which are more than 500 years old, or try your luck fishing. At Tickfaw State Park in Springfield, boardwalks take you through four ecosystems. You can take a hike, rent a canoe or bring the family to spend the night in a cabin. Kids can cool off at the water playground. Springfield is also home to Carter Plantation, with an 18-hole golf course that makes its way through live oak flats, cypress wetlands and upland pine forest. The course is a member of the prestigious Louisiana Audubon Golf Trail, and its designers went to great trouble to preserve Carter Plantation’s indigenous plants. The Baton Rouge region holds plenty of charm for people who prefer their entertainment indoors. The area is well known for its lovingly restored plantations, a treasure trove of magnificent homes and gardens stretching along River Road. Some have been turned into bed-and-breakfast inns, while others have special dinners at holiday times. Although the homes tell the story of the rich planters who built them, some also reveal what life was like for the slaves who made the grand homes run. At Evergreen Plantation, for example, you can see 22 slave cabins and many other outbuildings where the hard work was carried out. Rosedown Plantation, now a state historic site in St. Francisville, is furnished with many pieces original to the 1835 mansion. Great care has been taken to return the lavish gardens to their original state, and the site also includes 13 historic buildings. At the nearby Audubon State Historic Site, southeast of St. Francisville, you can tour Oakley House, where famed bird artist John James Audubon stayed in the early 1800s. Along with the plantations, be sure to tour the African American Museum and Gallery in Donaldsonville. The museum covers the legacy and importance of Africans in America and tells the stories of slaves, free people of color and the contributions they made. The town of St. Francisville itself is a popular place with visitors interested in the area’s history. The town’s Historic District contains 140 buildings, including churches, homes and the West Feliciana Historical Society Museum. • The Old State Capitol, a gothic building now home to a museum of political history. It’s the place where larger-than-life Gov. Huey P. Long was assassinated. • The Shaw Center for the Arts, a striking building that encompasses a theatre, museum and educational center. • LSU Rural Life Museum, where you can time travel to see what rural life was like in the 19th century. • The USS KIDD Veterans Memorial and Museum, a restored World War II destroyer. New Orleans is known as a fascinating place to shop and dine, but many people don’t realize that both the city and the region around it include lots of spots to enjoy the great outdoors, too. In the city itself, City Park’s 1,300 acres provide plenty of green space for the urban area. The park encompasses four miles of bike paths from Bayou St. John to Lake Pontchartrain, along with 26 tennis courts, a new 18-hole golf course and Couturie Forest, a great place for bird watching. Audubon Park in the Uptown area is home to a world-class zoo, riding stables, baseball and soccer fields, tennis courts and a golf course. For an up close look at Louisiana’s wetlands, check out Barataria Preserve, where boardwalks and dirt trails crisscross 23,000 acres of wetland. Plaquemines Parish and the barrier island of Grand Isle are known for premier fishing. Golfers might want to visit the Tournament Players Club of Louisiana in Avondale, just a short hop from New Orleans. TCP is home of the Zurich Classic of New Orleans, a PGA Tour event. Visitors can also hit a round at private country club English Turn, also located close to New Orleans. More outdoor pleasures await in St. Tammany Parish, just across Lake Pontchartrain from the city. Bicycle riders are sure to enjoy the Tammany Trace, a 31-mile trail that connects five unique communities, with beautiful green spaces in between. Originally a corridor for the Illinois Central Railroad, the Trace is open to walkers and roller-bladers as well. St. Tammany Parish also has almost 80,000 acres of wildlife preserve. For bird watching, try the Northlake Nature Center, 400 wooded acres along Bayou Castine. Pick berries in the little town of Hammond, go sailing on the Tchefuncte River, or head to Slidell and try your luck on a fishing charter. In Folsom, take a tour at the Global Wildlife Center, where both kids and adults will feel like they’re on an African safari. Giraffes, zebras, camels, kangaroos – they are all there and will literally eat out of your hands as you ride through the beautiful grounds. • Grand Isle, one of Louisiana’s barrier islands, home of the Annual International Tarpon Rodeo. • Start your morning with café au lait and beignets at Café du Monde on Decatur Street, a New Orleans tradition for generations. • Walk off those donuts with a stroll through Woldenberg Park, enjoying its views of the Mississippi River. Visitors with children might check out the Audubon Aquarium of the Americas with its IMAX Theatre. • Just a short walk away is the National World War II Museum, where you can spend the day immersed in living history. • Get a different perspective at the New Orleans Museum of Art near City Park, with its outdoor sculpture garden; and the Ogden Museum of Southern Art and the Contemporary Arts Center, both on Camp Street in the Warehouse District. • A good way to see the city’s historic Uptown area is to hop on the St. Charles Avenue streetcar. Ride it along the avenue to see gracious mansions and the campuses of Tulane and Loyola universities. No trip to New Orleans would be complete without several meals. Choices are plentiful, including well-known white-tablecloth restaurants like Antoine’s, Arnaud’s and Galatoire’s in the French Quarter or Clancy’s and Brigsten’s Uptown. Make time, too, for a meal or three at more funky local cafes like Jacque-Imo’s on Oak Street, Liuzza’s on Bienville Street or Mondo, Chef Susan Spicer’s casual restaurant on Harrison Avenue in the Lakeview area. Many of the city’s hotels feature lovely bars, just right for an after-dinner drink. Next, venture a bit outside downtown and check out the shopping scene on Magazine Street, with miles of boutiques and eateries. You’ll find many specialty shops such as As You Like It Silver Shop, a great place to find both active and inactive patterns, and Hazelnut, where locals and tourists alike find stylish gifts with a New Orleans twist. In Uptown New Orleans, you’ll find the campuses of Tulane and Loyola universities and the Audubon Zoo, where animals live in natural habitats rather than cages. A bit further from New Orleans are other interesting attractions. Across Lake Pontchartrain is historic Covington, with its boutiques and cafes, along with the towns of Ponchatoula, known for its antiques shops, and Madisonville, a boater’s paradise that lies along the banks of the Tchefuncte River.